Opened in 1955, Bell Bay Aluminium was the first aluminium smelter built in the Southern Hemisphere beginning as a joint venture of the Tasmanian and Australian Governments, primarily to overcome the difficulties of importing aluminium during wartime. Located just south of George Town, Bell Bay Aluminium produces around 185,000 tonnes of aluminium per annum. The smelter operates 24 hours a day, 365 days a year. Bell Bay Aluminium’s main metal products are ingot, block and T-bar. Over 80% of Bell Bay Aluminium’s product is exported, mostly to Asia. It comes back as, amongst other things, aluminium foil and cans, wheels, engine blocks, cylinder heads even planes. The smelter is a major contributor to the Tasmanian economy, creating employment, export earnings and direct investment through purchase of goods and services, and community programs. 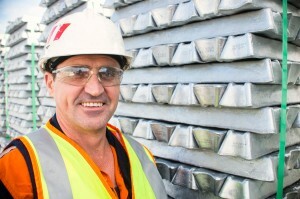 Independent studies have found Bell Bay Aluminium directly employs around 500 Tasmanians , indirectly, employs over 1,000 more, and contributes $690 million per annum to Gross State Product.